We're at a FORT! The fort has PUMPKINS! We have time to just be. It feels like we didn't before ths trip. The infamous sheep herding incident. See how I'm lamely pointing in the direction the sheep need to go? Jeez. 1. Going back to the town you grew up in for this long is kind of a head trip and a lesson in humility. Especially when that time is mostly dependent on the generosity of your parents. And you're 42 years old. 2. Trav is shaking the dust of our former stress-filled life, and I love him so much I can't stand it. To address #1 on the list: Travis and I are from Winslow, Maine. We both graduated from Winslow High School and neither of us have spent this much time here since we were in our early twenties. Usually when we come back for a visit, our time is short and jammed with activities, but now...we are really LIVING here again. We pick up sandwiches from It's a Good Pizza. We hang out with our parents. We throw rocks in the lake. After 17 years in Telluride, where we had established, adult-ish lives, iron-clad schedules and a traditional school routine, to be back here without any of those things feels like...well, it feels like we are reliving our childhoods. It's been really wonderful (Yummy home-cooked meals! Minimal responsibilities! ), but now it's starting to feel like we're in some weird time warp and I should be saving my baby-sitting money for a school trip to Boston. Don't get me wrong, all of this time here has been AMAZING, and I could easily stay here a while longer, savoring the comfortable pleasures of sipping Carlo Rossi jug wine with my Mom, paddling the canoe with Hud and Viv on 3 Mile Pond and going to bed at 8:30 every night, but that is not to be. In less than 3 weeks we drive Marshmallow to Florida where our boat is stored, and the next, super foreign, labor-intensive and slightly-more-than-intimidating part of our adventure will begin. It's time. Most of you know that Trav and I have been friends since we met in the 4th grade and that I am crazy about him. He's my best friend , an inspired, creative, loving Dad, and the impetus behind the crazy/joy/spontanaeity that is Moxie Family Adventures. (All of this was his brainchild- did I marry a gem or what?) What you may not know about Trav is that for the past 6 years, he has been building his property management company in Telluride at what has seemed like an insane rate, and he has been working like a dog, often 7 days a week, from early in the morning to late at night. The stress and intensity of that workload created a version of Trav that I hadn't seen before. It was a Trav that seeemd to be missing something, a Trav that didn't smile as often or laugh as easily. He wasn't grouchy or unreasonable, he was just...different. On vacations I would catch glimpses of the carefree Trav of our childhood, but it would take a least a week of decompression time to get to that point and then before we knew it, we'd be back in the grind again and the new, stressed-out, grown-up version of my husband would return. At first I thought, "This is just what it takes to be successful. This is life." I convinced myself that foregoing happiness in the short term was part of a long-term requirement that every responsible adult must fulfill. I didn't see that it could be any other way, and that made me sad. "FLU SHOTS NOW AVAAAAAAAAAAILABLE AT CVSSSSSSSS! "), then I know he is happy. And that makes me happy. I married a goofball and that's how I want him to stay. 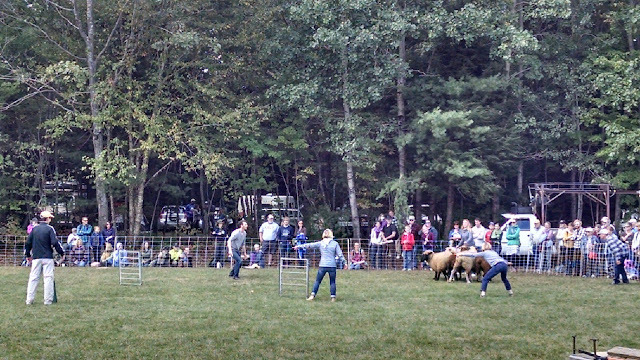 We were at the Common Ground Fair recently and there was a sheep herding demonstration with border collies. After the dogs finished showing off their impeccable command of the livestock, the farmer invited some human-folk to join him in the arena and try their hand at herding the animals. Of course, Trav and I , along with 2 other couples, volunteered. Hey, I was trying to be gutsy and daring, the new me, Adventure Girl! But as I learned, I am still just ME, and what happened next I swear would only happen to ME. It bears mentioning that the arena was huge and that THOUSANDS of people were watching. This is not an exaggeration, there were THOUSANDS OF PEOPLE WATCHING ME HERD SHEEP. Our first task was to corral a group of goats through a line of cones and into a pen. Trav became the natural leader of this effort , waving his arms, giving directions, telling everyone where to go, and of course, he did all of this expertly, almost as if he had been born and raised on a sheep farm. You need to know this about Trav: he's good at just about EVERYTHING, nothing ever seems hard for him, and you can always count on him being the best at everything he tries, no matter how weird or random it is. The sheep farmer even offered him a JOB. I'm not kidding. The next thing we had to do was move a group of sheep through the cones and through a metal chute. Right away, I could see that the sheep were harder to control than the goats. They didn't pay attention to our wild gestures and running so much, so I started pointing towards the chute and telling them, in plain language, where to go. They totally ignored me. After a while, we managed to corral the sheep, but we made a fatal mistake-- we crowded them as they moved through the chute, which I guess made them nervous. The next thing I knew, the sheep all began leaping out of the chute, flying through the air like a woolly hailstorm. One of the sheep, who had been identified earlier by the farmer as "the difficult one", looked me straight in the eye, paused, and then made a furious beeline in my direction. It took me a second to realize that the SHEEP WAS COMING STRAIGHT FOR ME. THE SHEEP WAS GOING TO TAKE ME OUT! Because I apparently have no instincts or reflexes whatsoever, I did absolutely nothing to get out of her way. She charged between my legs, sending me first up onto her back ("it was kind of like you were SURFING THE SHEEP", my sister-in-law Brooke later described), and then flipped me over and sent me flying through the air. I landed ungracefully. The crowd made a worried, embarrassed-for-me sort of "Ohhhhhhhh" sound. The farmer asked if I was alright. Yes, yes, I'm alright. Fake smile trying to cover intense blushing. Next time I write, I need to tell you all about homeschooling-- it's kind of blowing my mind (in a good way.) Until then, thank you so much for following us and reading all of this. Writing about what we are experiencing helps me to make sense of it all, and to appreciate it even more.